Wayside Baptist Church in Hagerstown, Maryland wanted to reach the Deaf in their area but no one in their church knew how to sign. Through God’s leading, Pastor Waddell contacted us about spending two weeks at the church to teach them how to reach their Deaf friends. We recently finished teaching them how to sign and witness to the Deaf. The church members learned well and we were blessed to be with them. Sometimes, toward the end of a two-week class, we pray that God would give us anyone who would show a small glimmer of hope of interpreting and leading the ministry. That certainly was not a problem at Wayside. God gave us 16 faithful students, many of whom showed great skill and interest in interpreting the services. We made many contacts in the deaf community. Even though there are other good ministries working with the Deaf in Hagerstown, they all seemed friendly to assist the new ministry and work together to reach the unreached. The church has even had a deaf man visit one of their services already. Does your church want to reach the Deaf around you? If we can assist you in starting a ministry we would love to help. 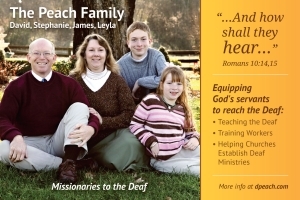 Our desire is to help churches and missionaries reach the Deaf. If your church already has a deaf ministry but needs more training and encouragement, please contact us about serving you in this way. A man called Silent Word Ministries a couple of weeks ago asking questions about the Gospel DVD in sign language he received two years ago in Las Vegas. The staff at Silent Word shared with him the Gospel via videophone and saw him accept the Lord as his Savior! This is continuing fruit from tracts and DVDs we distributed at DeafNation World Expo in 2010 in Las Vegas. The biennial event is quickly approaching this summer. Stephanie and I are thrilled with the opportunity to meet Deaf from around the world who need the Gospel. A major part of our ministry will be handing out tracts and Gospel DVDs to tens of thousands of hearing and Deaf during the week of July 28-August 4. We still need your help to make this trip possible. Your special gifts can be sent to BIO or through the PayPal Donate button at our website. Please mark all donations as Peach Las Vegas Trip. We still need $2000. Please pray for this special opportunity. The BIO Missionary Training School is scheduled for June 18-22. Please pray for this important week. Many of our missionaries will be with us. We get to hear from pastors and veteran missionaries on how to more effectively carry the Gospel to the world. Though I am one of the speakers, I also look forward to learning from the others. It is always a great time of fellowship and education. Thank you for all your prayers on our behalf. We appreciate you partnering with us in our ministry! We are almost done with the first week of a two-week sign language class in Leitersburg, Maryland. There are 16 people who have stuck with us so far and they are all doing well. Thursday night of this first week is always the hardest, but the students are hanging in there and still learning. The first week is all concentrated on vocabulary. They will learn 900+ signs before we leave! Or, at least I will teach that many. It will take them a few weeks before they feel like they have actually learned these signs. The students are getting them into their heads and certainly know much more now than they did when we started four days ago. Next week we will spend all our class time practicing and learning how to use the signs properly. I will teach interpreting principles and how they can minister to the Deaf in a spiritual and physical way. I praise the Lord for the many good students in the class. I am also thankful for the great contacts in the Deaf community we have been able to make. Though there are several deaf churches and deaf ministries within an hour of this small town, the ones I have talked with have been friendly and excited that we are starting a ministry in this little pocket of Maryland. There are three small towns around Leitersburg that have Deaf who would have to drive at least 30 minutes to another ministry. God can use this new work to reach those who have never had a church show interest in them nor share with them the Gospel. We appreciate your prayers as we continue to teach. The students are doing well but feeling buried under a pile of signs that seem so confusing at the moment. I pray the weekend will be a welcome break for them and that they will be refreshed on Monday to start learning the new concepts. God was good and gracious to us on our recent 6,000 mile trip. I preached in Texas, Oklahoma and Arizona. I love encouraging believers to help the cause of missions through prayer, finances and personal surrender to God’s call. I preached or spoke in almost a dozen churches in March. Two of these churches were Deaf churches in Arizona. We also met with more than 30 pastors or individuals on this trip. Of course many of these meetings were with Christians, but several were with friends we have made through the Internet. It was a joy to share the Gospel and give them specific recommendations for churches in their area. We crisscrossed the state of Arizona several times. We were in 5 different churches out there. One of the meetings was a Fantastic Saturday with our friends Jon and Diane Barr from Silent Word Ministries. The day was filled with activities and teaching specifically for Deaf and deaf workers. The main reason we went to Arizona on our trip was to spend time with missionary Mike Remington and his family. Mike is a BIO missionary who, along with his wife Amy, has a love for people. They specifically have been led to reach out to deaf young people who struggle with alcohol, drug and rebellion problems. Mike invited me to preach at a camp-out weekend which he does twice a year. I preached two times on Saturday, taught Sunday School and preached at the deaf church on Sunday. We had 22 young people at the camp out with six being first-time visitors. After my second message on Saturday evening four of the campers accepted the Lord as their Savior! I dealt with two young men who raised their hands for salvation after the message. As I finished talking to them Mike was sitting down with two more to lead them to the Lord. I thank the Lord for allowing me to be a part of that great weekend. Mike’s father-in-law will join the team going to Deaf Nation World Expo this summer. This is an event that Stephanie and I will participate in where we will distribute tracts to Deaf from around the world. God used this event two years ago to bring dozens of Deaf to Himself. This summer we look forward to handing out tens of thousands of tracts and DVDs. We will also witness one-on-one with the Deaf and hearing we meet. We need to raise $2,400 so that Stephanie and I can be part of the team in Las Vegas. Would you like to take a financial role in this great event? You can mark your donations Peach Las Vegas Trip when you send them to our mission board. If you would prefer to donate through PayPal you can do that at our website: www.dpeach.com. Make sure you note what the donation is for so that we will know how to use the money properly. The next several weeks will be no less exciting. I will speak in a couple of mission conferences as well as teach a sign language class in a church for two weeks. We appreciate your prayers as we travel and spread the burden of reaching the Deaf.